This remote string of islands off the Atlantic coast of Africa offers extremely rich and fertile soils due to its volcanic terroir. Coffee on Fogo Island has been adapting to the dry, arid climate for over 300 years. This has allowed the beans to develop mature and persistent flavours. The Fogo Island is home to just over 37 thousand people. Coffee has been its main export for many years. Until recently, this Cape Verde crop has remained relatively off-market. Investments to the plantation from overseas have allowed larger yields to be produced and now trade to USA and Europe is in full bloom. Commitment to maintaining, pruning and replanting the plants has increased both yield and quality. Farmers are also being educated to produce a good crop and a financial, innovative approach is encouraging the modernisation the processing chain. Tastes of strawberry and hibiscus are apparent, with a balanced acidity and a wet, thin body. These are some of the first green beans to come into the UK – this is truly exciting and a must for the coffee connoisseur. 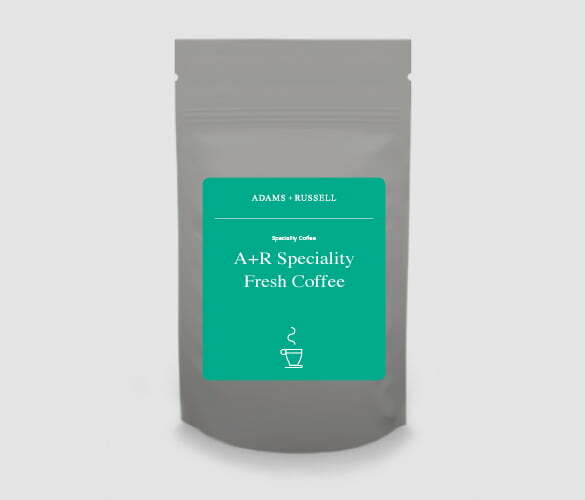 The Adams + Russell roastery is ideal for preparing and roasting speciality coffee. We only hand roast in small batches to guarantee freshness and excellent cup quality upon arrival of your order. If this is not quite what you were looking for, please see our wide range of single origin coffee for more inspiration. These premium beans are a real gem. It’s complex array of flavours make it truly unique and is something we want everyone to experience. If you do purchase this coffee, the way you brew it can completely change the way it tastes. If you decide on beans, you will first need a grinder. To brew, there are a few options. For those on the go, our aeropress can brew high quality coffee in just 11 seconds. Our Cafetiere’s are also a great option for travel. If you prefer coffee in the comfort of your own home, why not try a luxurious stove top espresso maker.